A mysterious water leak that forced NASA to abort a spacewalk on Tuesday (July 16) shows just how perilous it can be to venture outside the protective confines of the International Space Station. 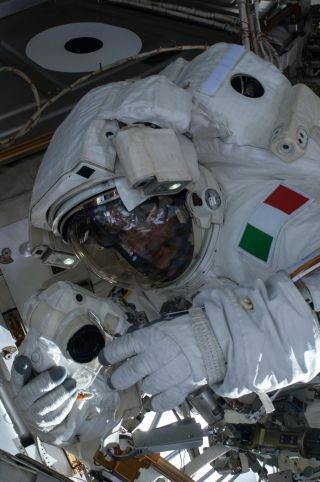 Tuesday's two-person spacewalk was supposed to last 6.5 hours, but mission controllers called it off after just 92 minutes when water began collecting in the helmet of European Space Agency astronaut Luca Parmitano. "I would say today was certainly a very serious issue," lead spacewalk officer Karina Eversley told reporters Tuesday. Extravehicular activities (EVAs) like the one undertaken Tuesday by Parmitano and NASA astronaut Chris Cassidy are complicated maneuvers with many elements of risk, NASA officials said. A micrometeoroid strike could breach an astronaut's spacesuit, for example, exposing him or her to the vacuum of space. Or a key system could suffer some sort of malfunction, as happened Tuesday, threatening a spacewalker's ability to communicate, breathe or navigate back to safety. Every spacewalk is planned out in minute detail to minimize the risks while giving astronauts the best chance of completing their scheduled tasks, officials said. But just getting everyone back inside the International Space Station safely is the primary goal every time, they added. "We don't take EVAs lightly at all," said spacewalk flight director David Korth. "Everyone that goes out the door — we try and do our best to meet the requirements, but when the crew is back in at the end of the day, that's success." NASA officials are still investigating the cause of Tuesday's leak, which introduced 34 to 51 ounces (1 to 1.5 liters) of water into Parmitano's spacesuit, with most of it gathering in his helmet. The number one suspect at the moment is the suit's cooling system, Eversley said, adding that the problem is a new one for spacewalk officers. "We have not seen a situation like this before," she said. "Overall, I would have to say that our [space]suits are very robust. They're well designed, and we don't very often have problems with them." Glitches have cut spacewalks short before. In 2004, for example, a pressurization problem with NASA astronaut Mike Fincke's oxygen tank ended an EVA after a mere 14 minutes. Tuesday's spacewalk was designed to help prepare the orbiting laboratory for the arrival of a new Russian module later this year and perform a variety of maintenance and repair work. The tasks will be completed at a later date, after engineers determine the cause of the water leak, NASA officials said.